Israeli Prime Minister Ehud Olmert on Tuesday condemned Tehran's attempts to deny the Holocaust ahead of his talks with German leaders, which are expected to focus on renewed hopes for peacemaking, Iran's nuclear ambitions and tension in Lebanon. Before the talks with Chancellor Angela Merkel and President Horst Koehler, Olmert visited a memorial at Berlin's Gruenewald train station, the departure point for thousands of the city's Jews to concentration camps during the Holocaust. 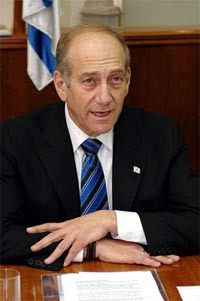 In an address, Olmert referred to attempts by Iranian President Mahmoud Ahmadinejad to deny the slaughter of 6 million Jews by the Nazis and a widely criticized conference in Tehran attended by prominent Holocaust-deniers from around the world. "We have learned and memorized the lesson (of the Holocaust); the weak and defenseless are doomed. Doomed are they who do not believe those who threaten to eradicate them. Doomed are the complacent. Doomed are they who entertain the false illusion that they could escape harm and that they could rely on the mercy of strangers," he said. Merkel met with Olmert at his hotel for three hours on Monday night to talk about efforts to resume Israeli-Palestinian peacemaking as well as Iran, said Olmert spokesman Jacob Galanti, reports AP. Before his first visit here as prime minister, Olmert called on Germany to sever its vast economic ties with Iran, saying Berlin's obligations toward Israel were greater because of its Nazi past. He also listed Israel among the nations that are nuclear weapons powers, though his office said his remark was misinterpreted. Since the end of World War II, Germany has paid billions of dollars in reparations to Israel and victims of the Holocaust, and relations between the countries have been strong. Germany considers Israel's security to be a pillar of its foreign policy.